Preboot eXecution Environment (PXE) is an efficient way to boot Lenovo® servers without local media or storage. With the PXE protocol, the server boots from an image stored elsewhere on the network. 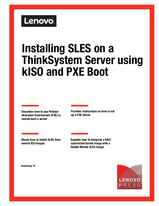 This document describes how to use PXE boot when performing a fresh installation of SUSE Linux Enterprise Server (SLES) 11 SP4 or SLES 12 SP2 on a Lenovo ThinkSystem™ server. The installation uses both the standard golden master (GM) ISO image plus a custom kISO (Kernel Update ISO) image, developed specifically for ThinkSystem servers, which include updated kernel, drivers and libraries.